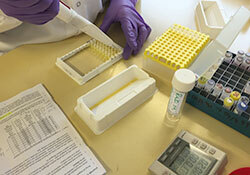 High-quality laboratory investigation is critical to understanding the impact of a country's vaccination programme on the prevalence and spread of disease. Suspected cases of measles and rubella may well be caused by other pathogens that have similar clinical symptoms. Even a penicillin allergic rash can be mistaken for a measles or rubella infection. The only way to confirm whether a case is actually measles or rubella is to test a suitable clinical specimen taken from the patient after the onset of rash for the presence of immunoglobulin M (IgM) antibodies or viral RNA. a global specialized laboratory in London, United Kingdom. the score from an on-site review, conducted periodically by the Regional Laboratory Coordinator or delegate. In 2012, WHO/Europe developed the Measles Rubella Laboratory Data Management System database (MRLDMS). This specimen-based database is a tool for online reporting of laboratory results that links epidemiological and laboratory datasets. This link is critical to achieve quality case-based surveillance. Several LabNet laboratories have already adopted this system (more than 14 800 records so far) and efforts are ongoing to increase uptake of this system by the whole Network. As the Region works to achieve measles and rubella elimination, it is important to identify hot spots of virus circulation, understand routes of transmission, establish the source of importations and monitor the progress of elimination to inform the verification process. In all of these areas, molecular epidemiology has become a crucial tool, and this is another important component of the work undertaken by LabNet. Genotype information is available online in the WHO genetic databases MeaNS and RubeNS, which were jointly established by WHO and the Global Specialized Laboratory (London). WHO European Measles and Rubella reference laboratories have recorded so far more than 11 100 measles virus sequences in MeaNS and more than 340 rubella virus sequences in RubeNS.